Whether you’re traveling overseas or for a simple weekend getaway and you want your pet to be by your side, you will require a qualitative carrier. 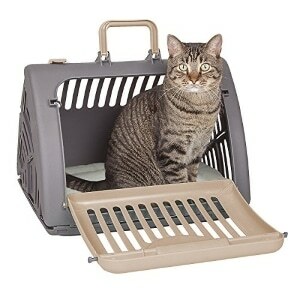 After carefully examining multiple items, we have concluded that the best cat carrier is the SportPet Designs Foldable because it comes with an additional bed for your cat to rest, it features a side-opening door that is wide enough for your cat to comfortably walk into, and it folds down for maximum convenience. If the SportPet Designs Foldable is not available for purchase, you could also try the new Sherpa Deluxe as a great alternative. Since it features a big side-opening door, you will have less of a hard time fitting your cat inside this carrier. The product is accompanied by a convenient pet bed, so your feline friend will remain comfortable all throughout the trip. This is a more compact option compared to others. Some consumers have reported that the unit comes with a few small spaces along the bottom edges where a cat can get a nail or small paw stuck. This model is convenient, versatile, and remarkably easy to use. Having a customizable size and various colors for you to choose from, this model will make it possible to adjust the luggage to your cat’s preferences and needs. 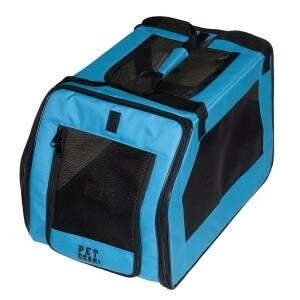 Your pet will definitely like this “travel house” because it has windows that ensure good ventilation and visibility. You may find it hard to remove the odors from the bag if you take your cat on a long trip or flight, for example. You can try to air dry it or use enzymatic cleaners. 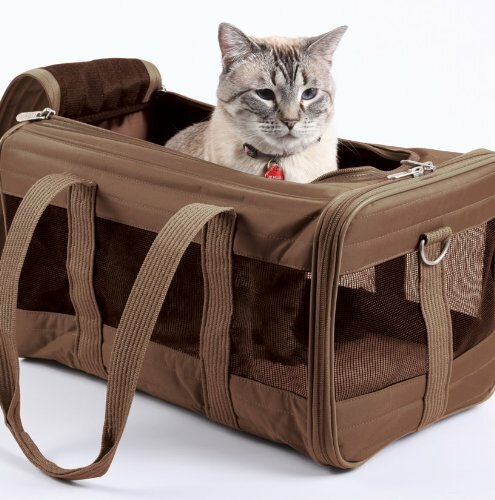 This comfortable model will make travel enjoyable for your cat. Featuring a sturdy steel and plastic construction, this carrier is undoubtedly built to last. It has two doors, so it can make it easier for you to get your cat inside it. The carrying handle is durable, as well as ergonomic, which means that transportation won’t be that much of a pain. Some buyers note that this unit looks larger in the photos at many online retailers, so if you have a bigger cat or a larger dog, this option is not suitable for the animal. Suitable for most small-sized pets, this item is definitely worth considering. There are plenty of cool designs when it comes to cat carriers, but how do you know you made the right purchase for your own pet? Although it is impossible to cover all existing products, some of the best cat carrier designs are showcased below. The item comes in a cool and original design featuring tan and grey colors that are soothing and relaxing for your cat. 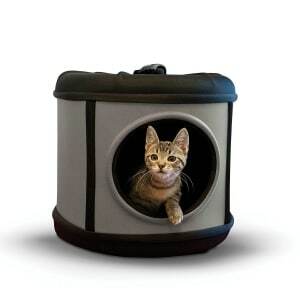 The product features a large side-opening door to allow your cat to open it easily and comfortably walk into whenever traveling. It also includes a super comfortable pet bed for your cat to rest its legs when traveling long distances. The comfortable bed has the ability to reduce stress and anxiety caused by moving and traveling to unknown places, allowing your cat to relax and enjoy the ride. The product easily folds down to reach a compact and lightweight design that can be conveniently stored anywhere whenever you are not using it. The pet bed is machine washable and dryer safe for easy cleaning after each use. The cat bed and carrier is large enough to accommodate almost all cat breeds and size, but make sure to compare your pet’s dimensions with the ones provided by the manufacturer to ensure your cat has enough space for a comfortable journey. The item comes in three different sizes and four different color displays, to perfectly match your cat’s personality and the rest of your luggage. The item is suitable for whenever you want your cat to travel in style. Thanks to this carrier, you can take your lovely cat anywhere you want, whether you travel by car or by plane for a comfortable adventure. The mesh windows secure perfect ventilation and visibility for you always to know exactly what your cat is up to and for it to see the world while being carried away. The top and the side entries feature locking zippers for extra safety, and the carrying strap is no-slip if you decide to carry your pet on your own. The product also features a rear pocket to store the food, treats, the leash, and any other accessory you think your cat might require a safe and comfortable journey. 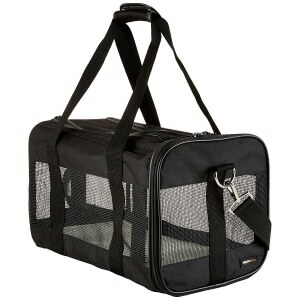 The medium size of this carrier is suitable for pets up to 16 pounds. The item comes in two different sizes and four different color choices, so you can pick the one that matches the personality of your cat the best. The product features a sturdy steel and plastic construction for safe and convenient transportation. The two-door carrier design enables easy access inside and outside for all pets. The overall design of the carrier allows maximum visibility so you can always check to see what your cat is up to, as well as for the pet to have a safe and exciting trip. The durable and ergonomic carrying handle helps you to safely pick up, carry, and put down the cage at any moment of your trip without harming your pet. Additionally, you can place a water cup inside the carrier to ensure your pet stays well hydrated during the trip. 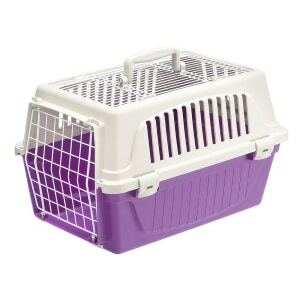 This carrier is suitable for smaller-sized pets and almost all cat breeds but, to ensure the item fits your cat comfortably, make sure to compare your pet’s dimensions with the ones of the cage. This portable and extremely convenient carrier come in three different sizes to accommodate your cat the best way it can. It folds flat for easy and convenient transportation and storage, so you can take it away with you anywhere you want. You can secure the carrier with any type of seat belt whether you travel by car or by plane and want to take your precious cat with you. The item is made of highly-resistant and breathable fabrics with large mesh insertions on the sides for maximum viewing. This way your cat will be able to see everything around it and enjoy the ride until you reach your destination. The multiple-exit designs help the cat to comfortably enter the carrier while the spacious interior is padded with a soft pet bed for sweet dreams and relaxation moments. Also, the mat is machine washable so your pet can travel in a safe and clean environment. This item is available in two different sizes and four different color schemes to accommodate most of your pets during traveling. The carrier works as a car seat as well, so you can rest assured your pet will travel safely and conveniently until the destination point. The carrier is made of breathable, strong, and lightweight poly fabrics with front and top mesh windows that ensure maximum visibility. All windows feature safety zippers so your pet won’t get any escape ideas during the trip. 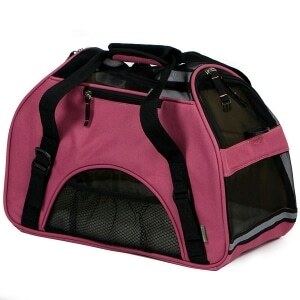 The bottom of the carrier features a comfortable fleece pad cover to ensure a good rest while traveling. The cover is machine washable also. Moreover, the two strong handles allow easy transportation, and the top exit can help your cat enjoy the ride on the outside as well. The rear pouches help you store small-sized items such as treats for your pet or its leash. The item is suitable for cats and short dog breeds. The item comes in different sizes to best fit the needs of your own pet, so make sure to compare the dimensions of your cat with the ones of the carrier prior to purchasing. This stylish carrier is made of strong and durable plastic materials and iron grates to enable a safe and comfortable ride until the destination point. The design is easy to clean so you can always wash it thoroughly after each transportation. 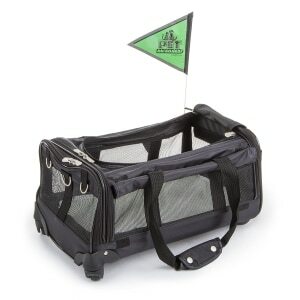 This is the ideal type of carrier if you plan on traveling for longer periods of time as it also includes a bowl of food and water to keep your pet well hydrated and fed. It is suitable for car and plane transportation, as long as it meets the standards of the traveling agency. 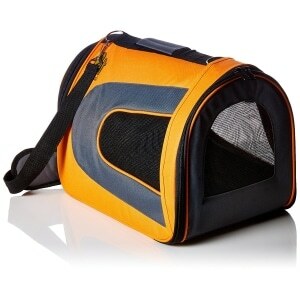 This particular carrier is suitable for smaller-sized dog breeds and most cat breeds. It also features a relatively large door in front for your pet to comfortably get inside, as well as a sturdy handle on top. The item is made in the United States by the American Company Pet Magasin Direct, that commits to provide optimum quality for all its pet products. This carrier is no exception, as it is extremely well-built and easy to travel with. The cage is made of top-quality poly fabrics, and large mesh rear walls for maximum visibility during the trip. The soft-sided carrier is airline-approved, so you can rest assured your precious pet will be traveling with you even on long distances. The inside padding adds comfort, while the mesh walls provide perfect ventilation. The handle on top ensures easy carrying and handling. The product also comes with an adjustable padded shoulder strap for convenient transportation if you want to stay close to your pet at any moment. The item is extremely lightweight, weighing only 2.2 pounds and is made of durable, strong, yet flexible and breathable materials. The waterproof coat will provide maximum safety for your pet even during rainy days. 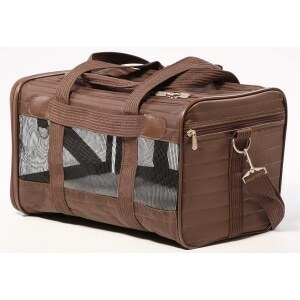 This cat carrier is perfect for traveling and comes at an unbeatable cost. It is designed with foldable mesh panels for maximum ventilation and visibility, so your pet can stay comfortable while still enjoy the view when traveling. 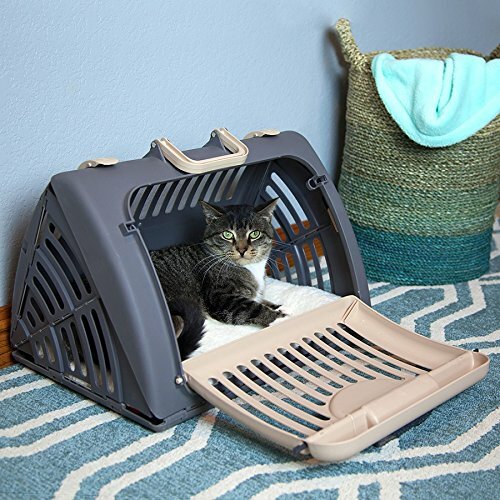 The product is made of sturdy and durable fabrics that are easy to maintain and clean so you can always provide a safe and clean environment for whenever your cat is traveling. The construction is lightweight to avoid fatigue during long distances, while the sturdy and comfortable handle allows you to carry this portable cage with you anywhere you go. Besides, the product is foldable meaning it won’t occupy much space when depositing and it extremely convenient to carry around with you anywhere you go. 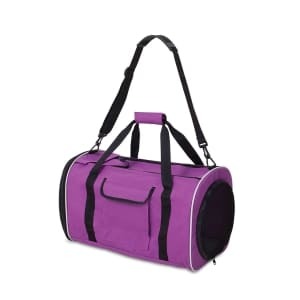 The carrier is designed to carry pets up to 18 pounds and comes in large dimensions, easily stretchable. However, make sure to prior measure your cat and compare its dimensions with the ones of the product to avoid bad surprises. The product comes in two different sizes to match most of the small pets, including small breed dogs and cats. It is suitable for traveling by car or plane providing maximum comfort and style for your pet. 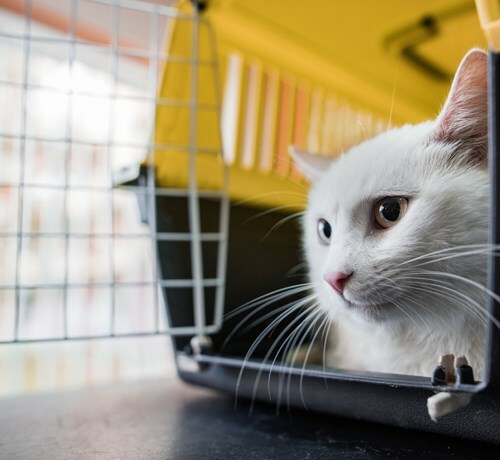 Whether you plan on carrying your pet with you for long distances or just a quick trip to the vet, there is no reason why your cat shouldn’t travel comfortable and in style. The patented spring wire frame is sturdy and allows you to push down the rear-ending of the item a few inches for under-seat traveling. This carrier is specifically designed to meet the needs of airplane transportation, and it was approved for use on most airlines. However, make sure to read the specifications of your traveling company and see if you can carry your pet with you inside the plane. The item is made of breathable and strong poly fibers with large mesh windows for proper ventilation and maximum visibility. The side pocket is large enough to store all your pet’s trip essentials, including treats, small toys, or its leash. The product comes in three different sizes to match the needs of almost all small-sized pets, whether dogs or cats. To make sure you chose the right size, don’t forget to measure your pet prior to purchasing this item, and then compare the measurements with the ones of the product. Keep in mind that your pet should fit comfortably inside the bag and should have some moving space to stretch its legs, especially if it’s a long journey ahead. This particular item is designed to meet the standards of plenty airline companies for the under seat dimensions, so you can travel alongside your pet anywhere you go. The product is made of high-quality poly fabrics and features large mesh walls for proper ventilation and increased visibility. The fleece pet bed inside is machine washable and extremely comfortable for your pet. The carrier also comes with strong handles and adjustable shoulder straps for easy transportation. This product was specifically designed for cats which tend to get really bored, especially during long travels. The funky design on the outside is great for showing off your pet, while the interior hides true treasures for cats. 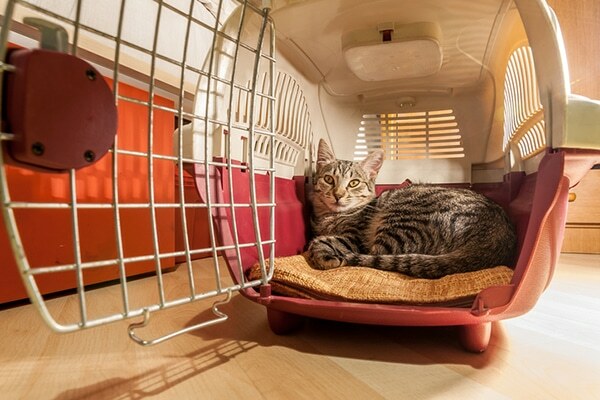 The smart interior design will encourage cats to play both inside and around the carrier, for stretching their legs and moving during a long trip. Moreover, the product claims to have miraculous anti-stress effects on cats that tend to be extremely anxious before and during traveling, especially if they are not used to it. The item is compatible with all other products and cat crawls accessories provided by the company, so you can create a real playground for your pet while traveling. If you purchase this item, you will get a base camp carrier, as well as a cat crawl for easy transportation and comfortable staying. 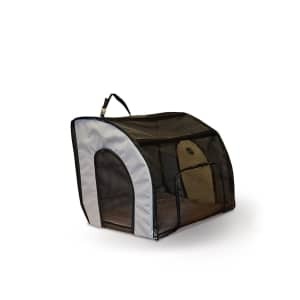 What we liked the most about this particular carrier is that you can attach multiple tunnels and other accessories to this product so it can truly become a full playground for your cat, whether at home or during long-term trips. This 3-in-1 product comes in three different colors to choose from, depending on you or your pet’s preferences. It is a bed, a carrier, and a full playhouse all in one, meaning there are plenty of things to do inside it. If you choose to wear it as a carrier, the item can be secured inside the vehicle using regular seat belts so your cat will arrive safely at the destination. The item is made of rugged 600-den polyester fabrics, durable and resistant in the long term. It also comes with a removable mesh door for increased ventilation and visibility while on the run, which you can later take off when you have reached your destination. The item works perfectly as a hiding place, a playground, and a napping place, thanks to the removable and machine washable pillow inside. The pillow is made of soft fabrics to promote a good night sleep or rest during the day. The item is sold in two standard colors – black and light grey. It features a military grade outer shell that is both hard and lightweight, so you can easily carry it with you anywhere you want. On the interior, you will notice a lightweight and durable foam that creates a safe and secure spot for your cat to hide, nap or rest during the travel. The item is fully foldable for convenient transportation and deposit whenever you’re not using it. This carrier also features two zippered mesh walls on the front and above for increased ventilation and visibility. The openings are made of a tough shell PVC material, which guarantees the item’s protection against falls or scratches. The built-in leash holder on the bottom is perfect for when you need to hold your pet into place after arriving at the destination safely. You can also place the product directly on the ground thanks to the rubber bottom grips. The product comes in two different colors and is suitable for basic pet transportation. It features an ergonomic handle on top and secure side locks to prevent your pet from escaping during transportation or endangering itself. This basic carrier is made of sturdy plastic and features a plastic-coated door, large enough to secure comfortable access for your pet in and out of the item. The easy opening top is suitable for pets who enjoy the ride and want to stay on top of the action. The detachable top can be removed to discover comfortable bedding for your cat. Also, thanks to the large grills that cover the entire product, good ventilation and visibility are secured. 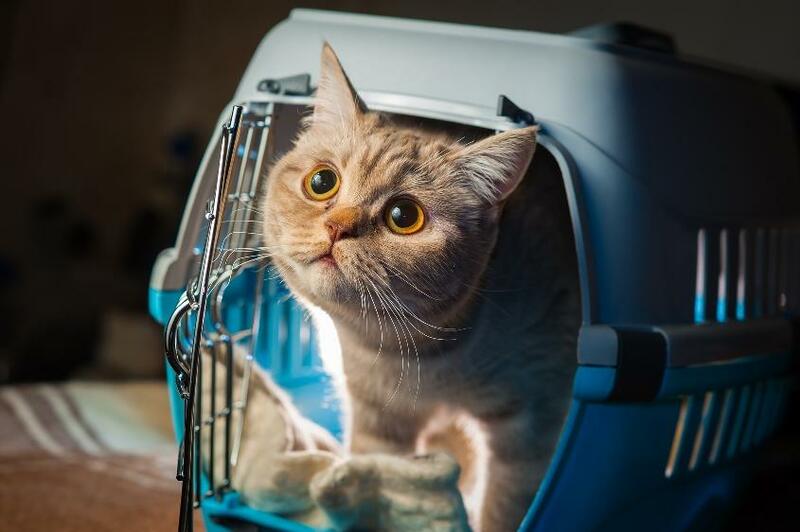 This way your pet won’t feel trapped and will constantly have access to what’s happening around them, helping them reduce stress and anxiety caused by traveling. The carrier is large enough to accommodate even 15-pound cats. 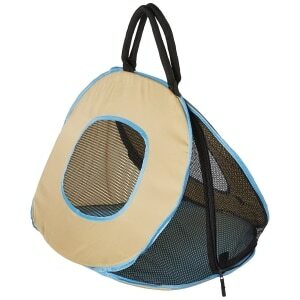 This carrier is available in two color options, and its size is suitable for puppies, teacup breeds, and kittens. Depending on the breed of your pet, we don’t suggest accommodating pets over 8 pounds of it. However, the item does come in various sizes, so make sure to carefully measure your pet and then compare the results with the ones of this particular bag to see if it fits accordingly. The item comes with a soft and comfortable bed made of fleece, as well as a rigid insert panel to maintain a sturdy shape of the carrier. Both the panel and the inside bed are removable for convenient washing and sanitizing. What we liked about this product is that it feature an exclusive “pet connect” side zipper that opens easily, allowing you to interact, soothe, and comfort your pet during traveling. This way you will reduce stress and anxiety, and your pet will enjoy a safe and stress-free ride. Just as its name suggests, this item is similar to trollers. It features wheels for easy and convenient transportation, reducing the stress and anxiety often associated with travels by your pet. The easy glide motion of the wheels will feel just as if your pet is riding its own vehicle, helping them enjoy the trip. The adjustable shoulder strap can be converted into a padded pull handle for convenient transportation. The item is made of breathable and machine-washable poly fibers that come with four mesh panels on the sides to ensure maximum ventilation and visibility. On the inside, the carrier is equipped with a faux lambswool liner that is detachable and machine washable. The bed will provide maximum comfort for your pet throughout the trip, helping them rest and sleep faster. The item is suitable for pets up to 22 pounds, but we do suggest to measure your cat or dog prior to purchasing the carrier to ensure a proper fit. Finding the best cat carrier for your pet is not an easy task, as there are countless options available for sale on the market. However, we hope that the following buying guide will answer all your questions and help you choose the main features that should be found in each good cat carrier. Before buying any item, we suggest going through some cat carrier reviews to see what other customers have to say about the product. It is always important to see other opinions, especially regarding the size of the carrier. Although most products come with specific measurements and maximum weight, it is advisable to measure your pet thoroughly before buying an item to see if your pet will have enough room to comfortably stay inside. Keep in mind that the carrier should be at least a few inches larger than the size of your pet stretching so it can comfortably accommodate it during long travels. Also, make sure to check the maximum weight of the product and compare it with the weight of your own pet. If your pawed partner happens to be a little “fluffier,” make sure that the handles of the carrier are strong enough to support its weight to avoid shocks or harm. If you own more than one cat, we advise you to place them in separate carriers, even though they get along well. Keep in mind that traveling makes cats anxious and irritated, so you wouldn’t want them to start fighting. If, however, you insist on taking them both, make sure to find the best carrier for two cats. Needless to say, it should have sufficient space for both of your cats to sit comfortably during the ride. 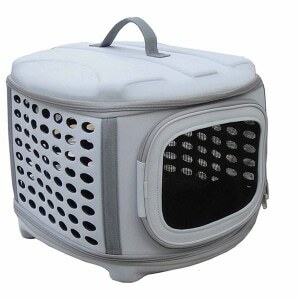 When choosing the best pet travel carrier, materials are extremely important. Some of them are more lightweight while others are harder to provide improved safeness and stability during transportation. However, most of the cat carriers are soft and usually made of nylon fabrics enriched with a hard bottom that can be removed to thoroughly clean the rest of the carrier. The main pro of these products is that they are lightweight and flexible, ensuring your pet more freedom of movement and space to stretch their legs. If we’re talking about the best car travel cat carriers or the best airline approved car carriers, they should be lightweight, foldable, and be able to reach the under seat space destined for such items. A good carrier for cars should be able to be secured by seat belts to ensure safe transportation even on long distances. Other types of cat carriers are made of hard plastic and metallic pieces. These are usually more reliable and stronger, being able to resist shocks or long distances better. However, due to their rigid construction, they cannot be stretched so make sure your pet fits easily into these boxes and won’t stay heaped or uncomfortable, especially if we’re talking about trips over a few hours. But, no matter the type of construction you choose, make sure the material is breathable or features large grills for maximum ventilation and visibility. If you opt for a soft carrier made of poly fibers, you should ensure that the item features at least two mesh walls to have easy access to your pet and see its every move. Similar, to reduce stress and anxiety primarily associated with trips, your pet should be able to breathe and see clearly the road ahead. In conclusion, we reckon that the best cat carrier for nervous cats should be made of soft, breathable fabrics with mesh walls for increased visibility and ventilation. As we previously mentioned, to make sure you made the right choice, it is always better to first read some reviews of cat carrier to see what other customers consider it is important and relevant in such an item. In our opinion, we believe that additional storage space is also important if you want to ensure a stress-free and comfortable ride for your pet. We consider that the best cat travel carrier should feature additional compartments for storing travel essentials such as the leash of your pet, snacks or small toys. If you plan a longer trip ahead, the carrier should also have a special room for water and food bowls that shouldn’t occupy the interior space of the item to avoid crowding. Accessories also play an important role in finding the right item for your dog, so make sure to check them carefully. For instance, the best way to get the cat in the carrier is for the item to have at least one large door. It would be ideal for the carrier to present at least two different doors for you to have easy access to your pet whenever you want. Moreover, some of the cats might get curious and might ask to enjoy the free ride from a “convertible” perspective, so it would be best if the carrier would also feature a zipper exit on top. Another accessory to look for is the interior bed of the carrier. A new cat bed should be made of soft, breathable, and comfortable fabrics to ensure your cat a good sleep or nap whenever it wants. It is also important for the bed to be machine washable so you won’t require a great flea spray for cats after each ride. Strong shoulder straps and handles should be a must as well to comfortably carry your pet around anywhere you want. If your cat easily gets motion sick, you might want to consider wheels on your item as a great alternative. 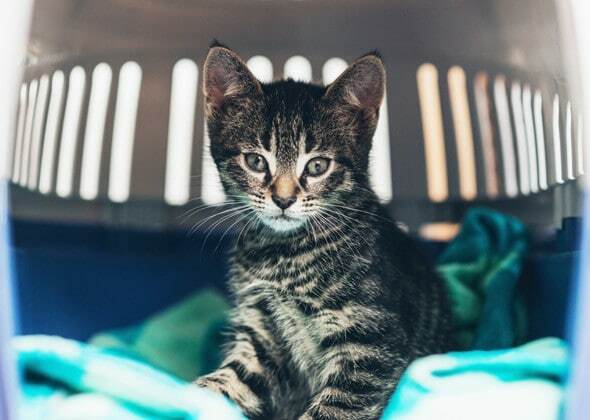 This is for your own safety as well, considering you don’t want to appeal to self-cleaning litter boxes and new interiors every time your cat needs to be taken to the vet. 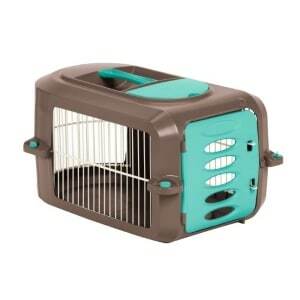 Can you use a cat carrier for a rabbit? Most of the carriers are made for universal transportation of pets, regardless of their species. 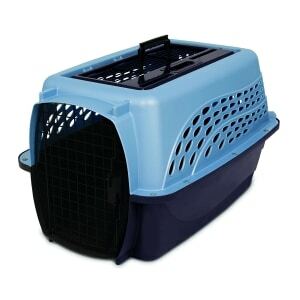 Thus, a cat carrier can be used to transport your rabbit, provided it features the right size for a comfortable travel. Make sure to carefully measure your rabbit and compare its size with the one provided by the carrier manufacturer. Rabbits enjoy dark and crowded spaces because it feels safer, but don’t buy a carrier that is too narrow for your bunny. Can you rent a cat carrier? Most of these products come for more than reasonable prices, so we would advise you to purchase your own. They can be sold for as little as 10 dollars so, if you don’t plan on traveling too much with your cat, it is worth investing in a regular plastic carrier. Since the prices are low enough, we don’t know if it is worth renting a carrier, even though you only plan on using it once. If, however, you don’t want to purchase your own product, we suggest asking one of your friends or acquaintances. What size cat carrier do I need? As we previously mentioned, the size of the carrier is the most important aspect you should take into account. Make sure to carefully measure your cat prior to purchasing and compare its size with the size of the product. Each carrier comes with approximate dimensions, as well as the maximum weight it can carry. The item should be large enough to comfortably fit your cat and allow it to stretch its legs. What kind of cat carrier should I get? This also depends on how often you will travel with your cat, and for how long. Some softly lined carriers made of poly fabrics are suitable for car or plane traveling because they can fit under your seat and can be secured with regular seat belts. Plastic and metal carriers are more suitable for long and bumpy rides with the car. They are less comfortable but will certainly provide improved safety and plenty of fresh air. How to clean a cat carrier? Most of the soft carriers are machine washable or can be cleaned using regular water and soap solutions or damp cloths. If you opt for a metallic or plastic item, we insist washing it with plenty of water and harsher, yet non-invasive solutions. There are plenty of cleaning substances you can appeal to as long as they are chemical-free. Keep in mind that your pets may be sensitive to chemicals, so it is best to use natural ingredients like organic soaps or vinegar. How to secure a cat carrier in a car? There are multiple ways to do that, depending on your cat’s needs. As we mentioned before, some of the carriers are specifically designed to perfectly fit under your car seat to ensure a safe and comfortable ride near you. Some other carriers feature safety systems with regular safety belts, similar to baby seats. If everything else fails, there is always the option of keeping the carrier near you at all times. Since the prices for these items are extremely affordable, we don’t advise you to try to make your own, but to purchase a professional product. If, however, you find yourself in a very DIY mood, you can try making your own cat carrier by using a regular duffle bag or gym bag. However, you should cut the sides and then cover them with mesh to provide proper ventilation and visibility. 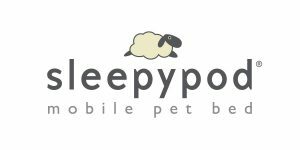 Sleepypod is the most renowned company that manufactures travel accessories for pets, including beds and carriers. In 2015, the brand received the distinction of Top Performer on behalf of the Center for Pet Safety. The company aims to provide the safest methods for carrying your pet with you when traveling. From beds and carriers to safety harnesses and travel accessories, we’re sure you will find everything you want at this brand. Their carriers come in countless shapes, designs, sizes, and materials to cover all your needs of your cat during traveling. Petmate got into the business over 50 years ago, designing the first dog kennel in a home office in Texas. Ever since then, the company has gone a long way, nowadays becoming one of the worldwide leaders in terms of traveling items specifically designed for dogs. Their kettles and carriers are made with love, passion, and determination in order to meet the needs of all pet sizes, and offer them a comfortable and enjoyable ride. The company continues to produce many of its items in the United States and has engaged in numerous charity events over the years. Although not in business for too long, Mr. Peanut’s promises to deliver high-quality products and services for pets who like to travel alongside their owners. The brand provides certified cruelty-free lifestyle products to fit the needs of your pets, regardless of their size. Mr. Peanut’s is located in Nevada, and some of its items are still produced within the US, managing to support local production. All of the products are constantly tested for safety and improved to provide the best quality and safety features for your pets. The company offers a wide range of products for pets, including toys, feeders, bowls, leashes, and travel carriers. 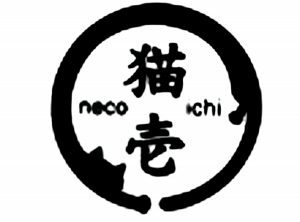 Necoichi is a brand designed 100% for the needs of cats and their owners. This Japan-based brand manages to successfully integrate the philosophy of the East with the ever-demanding desires of the West to create products specifically designed to meet the needs of cats. From fine-dining accessories to leashes and carriers, the company promises to deliver top quality. The design of the products is made for you and your cat to fall in love at first sight, managing to be playful, funny, charming, yet comfortable and convenient at the same time. Pet Magasin is a small company that specializes in producing quality products and accessories your pets will need, cherish and love. All products provided by the brand are backed by a two-year money-back warranty, so you can always claim your money back if the item you acquired doesn’t meet your standards or requirements. The company mainly creates accessories and items for dogs, cats, and aquariums. It the cat section you can find a wide array of fine carriers, heated beds, litter boxes, and even hammocks for the pickiest felines in your house. Finding the best type of carrier for your cat can prove time demanding and, in the end, quite a difficult job, especially if you don’t know what to look for. When it comes to the type of the carrier, the main battle is between hard and soft cat carriers, each coming with their own perks and flaws. In the end, it is up to you, and your traveling needs to pick the right and most comfortable product for your cat, so read below if you want to know more about each of these items. First of all, soft carriers have become the most demanding products in their category. Their main pros are that they are lightweight, resistant, and foldable. They can be easily deposited anywhere since they don’t occupy much space and can be taken with you anywhere you go. Most of these products are made of resistant poly fabrics that are waterproof and will keep your pet safe from harsh weather conditions. Soft carriers often come with large mesh walls on the side to allow maximum ventilation and visibility. This way, your cat will remain safe, will enjoy the fresh air as much as possible, and will also be able to watch the road and see on the outside, managing to minimize the stress and anxiety often associated with trips. However, soft carriers don’t provide improved protection against bumps, breaks or falls. On the other hand, hard carriers are often made of hard plastic and/ or metal, featuring large grills to allow perfect ventilation. They will protect your cat in case of falls or bumps and are often used when you travel long distances with your cat. Hard carriers are also easier to look after, sanitize, and clean after each ride, so your cat will travel safe and sound anytime. It’s obvious to anyone that even a great cat carrier won’t do its job properly if the animal is uncooperative. 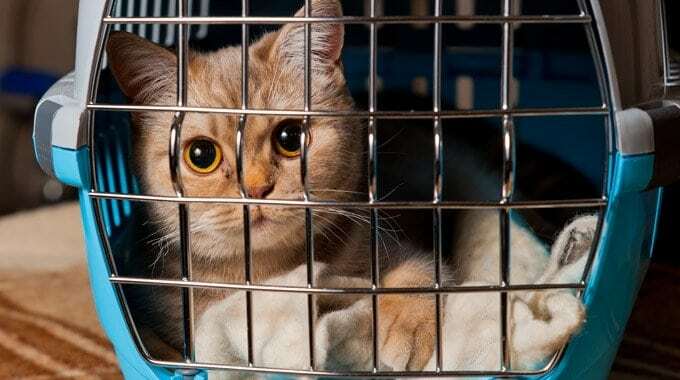 No amount of money or research time you spend on the item itself won’t make a trip to the vet less hellish for both you and your pet if the little prisoner protests with hisses and scratches against being caged and is then contentious to act out until being calmed down with a shot. That’s why it’s vital to first get your miniature tiger used to the carrier before even considering using it. This whole process — which can last for up to six months for adult cats — is covered in more detail elsewhere on this site. What you should take out from those articles is that the carrier must become a familiar item to the cat, placed where the pet can see it and made into an attractive feature by association with food or the animal’s favorite items. 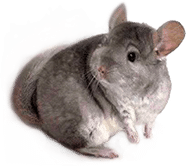 This will deal with actually getting the little furball into that confined space when you need it, that is before traveling or visiting the vet. The first thing to do is to prepare the carrier by placing an extra towel or a newspaper, something to soak up urine, as cats tend to pee if they get nervous. The towel will make for a better option between the 2, as it can be sprayed with cat pheromones to make it more enticing. It is easiest to position the carrier with the access door facing the ceiling, and that way you won’t have to make any awkward moves. In top-loading models, this won’t be a problem, but front-loading ones should be placed on their back edge, ideally with a wall for extra support. The way you pick the cat is very important for safely placing it in the carrier. Use one arm as a base around its hind with the other holding it by the chest. Hold the back legs of the cat like a spoon, propped up against your chest with the hand that serves as a base. The animal should be facing away from you so that it can easily jump when you take your hand off its chest. Lower the cat into the carrier in a slow motion, hind-end first, so that it doesn’t feel like it’s being forced into a cage with no way out. If it begins to struggle, it is better to put the pet down and let it calm down instead of hurrying the process. If this goes smoothly, your naturally curious cat should start examining its new surroundings right as the edge of the carrier gets over its head. Use this moment of distraction to close the door, secure the latch and reposition the carrier. Reward the pet with some treats if it’s been cooperative and then place a blanket or towel over the carrier, so the cat doesn’t see what’s happening outside. This will increase the level of comfort for most cats but should be avoided during hot summer days. Cats are naturally squeamish about interacting with their carriers and can make quite a deal of a fuss if not properly introduced to the thing. So that its next trip to the vet doesn’t begin with a scratching and hissing fit, a responsible pet owner can take a few simple steps to ensure his charge’s cooperation. First things first, the training process should commence as early in the cat’s life as possible, or immediately after the kitty arrives in your house, if it’s already an adult. As per the gear, you can choose from any of the critically acclaimed cat carriers on the market with the mention that cats prefer hard walls and you might sometimes need to get the top of the box off. The cat shouldn’t see its carrier as a foreign object, one that will surely get associated with unpleasant experiences. That’s why it is important to keep it in a highly circulated area of the house, where the pet will get familiar with it and will eventually decide to explore it on its own. To encourage this, try placing some of the cat’s favorite items inside, like its toy or favorite blanket, even an article of clothing from a person the feline likes in particular. Once the pet is familiar with the new place, you can begin training it to get inside at your request. Try making a line of treats, throwing a new one as the cat eats, that lead to the door of the carrier, with the final prize somewhere near the back wall. As you place the last treat, it might be a good idea to say a word, something like “carrier” or “vet”, that the cat will learn to associate with the pleasant experience of receiving something it likes. Once the cat goes in, sometimes requiring a nudge from you, make sure to reinforce this behavior by petting and offering another treat. This should be repeated again on the same day, without using as many treats. The one inside the box will work as enticement and the final one as reward. It might require 3 or 4 training sessions for the cat to get the hang of going in at your request. Once this happens, you can start to accustom it to having the door closed. Only hold it shut for a few seconds the first time, and then reinforce the experience with petting and treats if the cat has kept its calm. This should be repeated for several times a day over the course of half a week, progressively lengthening the amount of time the door will stay closed. 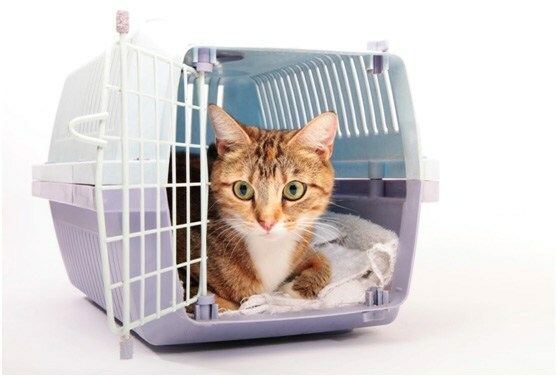 After the cat gets comfortable with being confined to the carrier, you can start to practice moving it about. Take him on a trip to another room, initially, and once there don’t forget to give him a treat for being well behaved. Repeat this for a couple of times until you think he’s ready for a walk to the car. Once there, close the door, put on the seatbelt and go through the moves of starting the car. You won’t really have to take a drive around the block at this stage, it’s enough to get your cat used to being inside a vehicle. Few animals enjoy being confined in small places against their will and will get nervous under such circumstances. But there’s also a natural instinct to associate snug spaces with safety. In cats, either one of these impulses can be triggered by a carrier box depending on what attitude it picked up towards it. 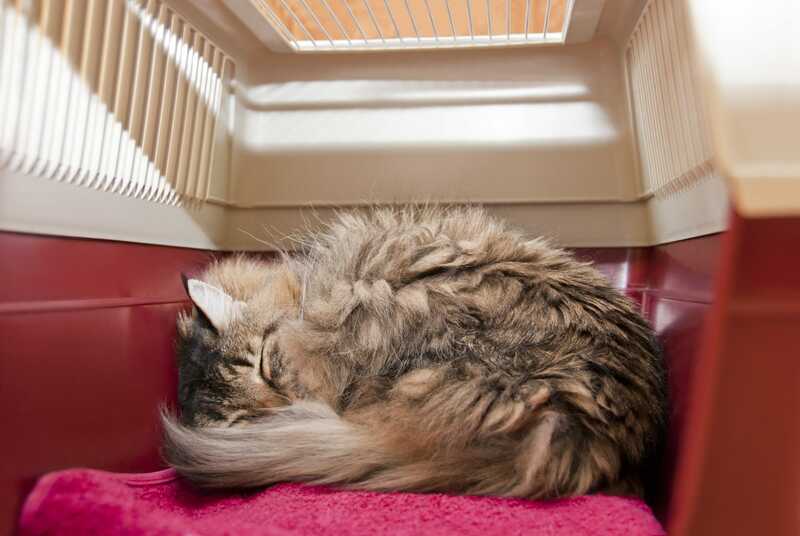 There’s a lot that can be done to make a pet see the carrier as a familiar place — if not even comfortable and friendly! — and we don’t need to tell pet owners how much grief this can spare both them and their cat when the time for the next doc visit comes about. 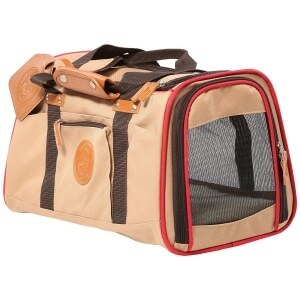 Naturally, the first thing to do is to ensure that you get an excellent cat carrier for you and your pet. Most experts recommend hard sided carriers as these seem to be the most comfortable for cats. In addition to this, some models have removable roofs, so the veterinarian can examine its occupant without getting it out into the unfamiliar place of the clinic. Carriers should definitely not be shared between owners, or bought second-hand, as these will inevitably retain the smell of the other cat it’s been used for. Cats have a very keen sense for this, and might get agitated at the thought of a rival nearby. The cat should feel that the carrier is a space it owns, or at least an integral part of the world it inhabits. That’s why the box is best kept in a well circulated area of the house, where the little feline likes spending a lot of its time in. Otherwise, the carrier will get associated with the discomfort of traveling, and will make Mittens bolt out at first glance. To ensure that the cat gets a pleasant feeling from its carrier, try to associate it with things it otherwise likes. You can place one of its favorite treats inside, or otherwise an item of clothing bearing the scent of the cat’s favorite person. This will entice it to use the box as a place to hang around in by its own volition. The cat’s first “visit” to the carrier will always be a stressful experience. Entice it to go inside by using a trail of treats that will get it closer and closer to the door with the final prize at the back end of the carrier. Once familiarity is established, the bowl of food can be strategically placed near the door of the carrier, so the cat might decide stay inside while eating. If your cat has already developed a negative association with the carrier, the best thing to do is take off the top and start using it as a cradle until the frightful pet is fully habituated. Some cats might be terrified of the door, that’s why it’s recommended to remove it before beginning carrier training. Once the little Tomcat gets over its initial fears and starts using the box as a place to hang around in, put the door back in its place and start experimenting with closing it for incrementally higher amounts of time.